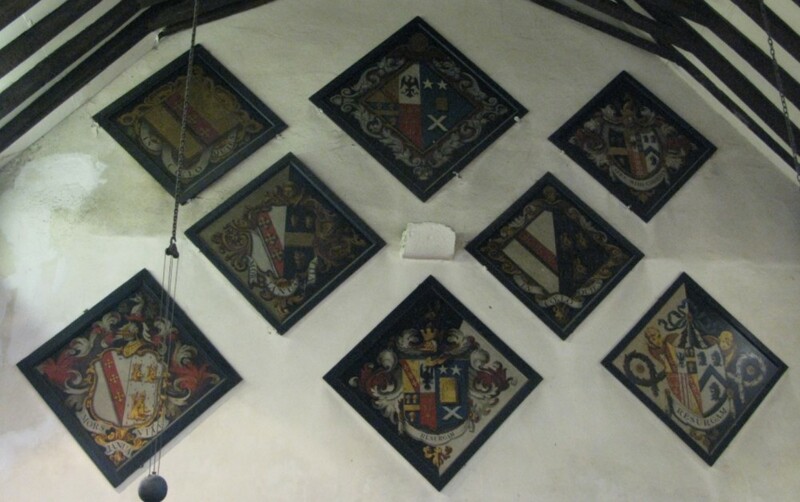 The dark wooden diamonds found on the inner west wall of the church above the entrance to the tower are the hatchments or armorial bearings of deceased members of the Polhill family. Between the 17th and 20th centuries it was the custom to carry them in procession to the church where the funeral service was held. They were then hung up in the Church after the ceremony. The arms are on a black background, or a white background if a partner still living. For married couples the arms of the husband are generally on the left looking at the shield and those of the wife on the right. MORS JANUA VITAE: death is the door of life. The oldest, F, belongs to David the Petitioner (died 1754) and E, to his wife Elizabeth Borrett of Shoreham (d 1785). 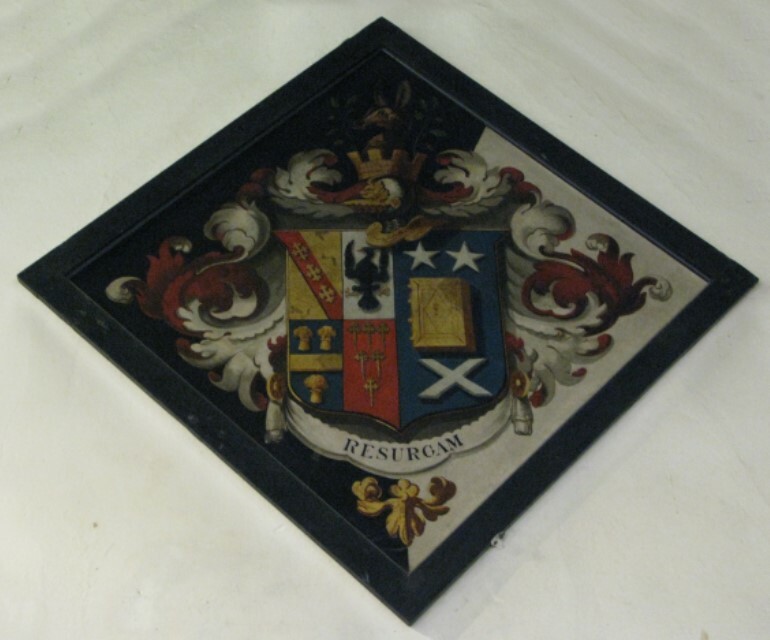 On both we can see the Polhill Arms on the husband’s side and the Borrett Arms on the other. David was the son of Thomas Polhill and Elizabeth Ireton, (grand-daughter of Oliver Cromwell). He was MP for Kent from 1708 and Sheriff of Kent from 1715. His memorial is on the south wall of the nave. A, Elizabeth Polhill, their daughter, who died 1815. She was a spinster and so the Polhill arms take up the whole shield. B, Mary Porteus, daughter of Bielby Porteus of Sundridge, Bishop of London. She died in 1847. Her shield shows the same set of arms as that of her husband. C, Charles Polhill, her brother, who died in 1805. This is complex as it has a centre panel with six sections showing the Polhill arms plus those of four of Charles’ female ancestors on his father’s side. 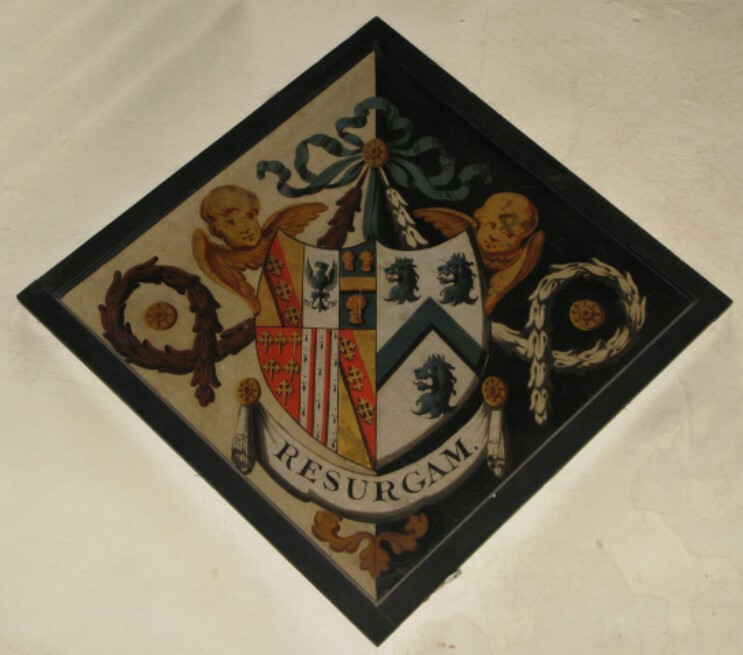 To the left of this looking at the hatchment are the arms of Charles’ first wife and to the right those of his second. D, Tryphena Penelope Shelley, Charles’ first wife, daughter of Sir John Shelley, 4th Baronet of Michelgrove, Sussex. They were married in 1754. She died in 1756, probably at the birth of her only daughter, Tryphena. This is a simple Polhill and Shelley shield. G, George Polhill, of Otford, Chipstead and Sundridge, who died 1839. 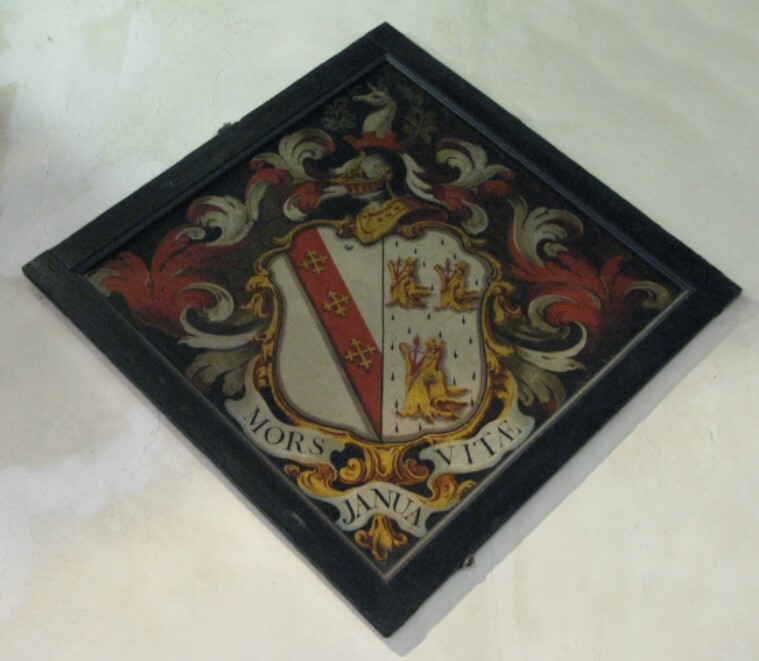 His side of the shield displays the Polhill arms as well as those of some of his female ancestors and his wife’s side has just the Porteus arms. George’s memorial is on the north wall of the sanctuary. H, Patience Hasswell, of Woodmansterne, Charles’ second wife who died in 1803 and who bore him seven children, most of whom did not survive their father. The Polhill part of her shield is very like that of her husband’s.